Theme, summons, countries, and more discussed. In the two years following the announcement of Final Fantasy Versus XIII, Square Enix hinted at shifting its focus to Final Fantasy XV. I started thinking of Final Fantasy XV under its current, numerically-based title about the time Final Fantasy Agito XIII became Final Fantasy Type Zero (in January 2011). This was also when we decided to gear the new title toward next-gen production. When I asked the programmers if we could aim the project at next-gen technology as we continued development, they said they were one step ahead of the game and showed me some clips they had been working on. At this point I thought it was conceivable to make a game that was compatible with both current and next-gen devices. (If the original plan was to release on PlayStation 3 as well, what changed?) We were actually planning on announcing our platform choices last year, but various issues and delays arose. This, plus the fact that the life spans of current generation systems were growing short, proved to be problematic. In the year we were delayed in making our announcement, next-gen research had continued and current-gen work wasn’t looked upon so well anymore. It also became difficult to announce that we wanted to continue work with current-gen technology. While we were trying to make the release before the next gen wave, the ultimate push to upgrade came from our company who didn’t want us with our hands tied in the current generation. (What are some of the things you wanted to do that lead to the shift?) We wanted to make Final Fantasy XV the most seamless experience we could. This meant we needed a lot of memory space for all the action taking place in game. The diverse weapons, various actions of your party, magic, and not to mention the enormous map and great variety of enemies to fight—all of these things take up a huge amount of data. There’s also lighting effects, game physics and filters which require resources, and in order to make a viable game, decisions must be made to accommodate all of these factors. (In reducing the amount of data and memory needed to make this game, was producing an FPS not considered?) Although we were promoting Final Fantasy as an action game, we didn’t think about working on an FPS. We thought about getting rid of UI, throwing away the damage point display system of previous games, and making Noctis the only playable character. But if we were to do this we would risk making Final Fantasy ‘just another action game.’ There was a big concern that we not forget that this is a Final Fantasy game. In the Final Fantasy XV trailer at E3 2013 you saw Noctis warping and fighting in a large areal arena. We are developing battle arenas like these where you can move around freely but still fight in a Final Fantasy-esque style. If we had continued work with current gen technology, what we have now wouldn’t have been nearly as sophisticated. We also really wanted to implement damage and changes made to the world map. PlayStation 3 was originally meant to be a home entertainment system. But thanks to the implementation of DirectX11, we no longer have to worry about the system model and can start making full-spec developments before choosing the hardware and platform that best fits the game we wish to create. The original Final Fantasy XV works on some pretty high specs, and whether the game will work on a system depends on the hardware it uses. In other words, if a system comes out that can support Final Fantasy XV, we will consider releasing a version for that system. Developing games in this way has been unheard of until now. (What sorts of differences can we expect to see between the original game design and the PlayStation 4 and Xbox One versions?) I’m hearing that both systems are adequately equipped to handle Final Fantasy XV, but how close they come to the original game design depends on the hardware. At any rate, there’s not too much I can say about this right now. (Will we be seeing anything developed for the PC?) We haven’t really considered release for PC, but we will if there is demand for it. At this rate, you would need a pretty high priced computer to run this game, but the more demand for a PC release the more we will consider it. (Have you been making use of Luminous Studio?) At our E3 2013 exhibition, we displayed samples from Luminous Studio. We plan on integrating with Luminous Studio and developing it alongside other projects. Once the game engine is complete, it’s safe to say that gave development will follow. It’s difficult to build a game engine without a concrete idea of what it will be used for. This is why we’re having the Luminous Team work side-by-side with the Final Fantasy XV team in building the game engine and game itself. (Will the use of Luminous drastically change anything about the game?) Of course. The camera has yet to be optimized, but we would like it not only to follow characters, but also give the impression that it is filming actual people in a very raw and realistic way. Since we are not filming actual people, we have to wait to see how close Luminous can come to this. But we are aiming to create pre-rendered movies which can be controlled or manipulated in some way. We are looking at both real-time movies and pre-rendered scenes to find which is the inferior method. Visual Works is making pre-rendered movies they call “Look Development,” while Luminous is working on the real-time project. The Noctis in the E3 trailer is of a high level and has access to the various weapons and warp techniques shown. You will not be able to use all of these techniques from the start of the game. Like in Kingdom Hearts, you will start the game with some simple but refreshing action, and learning will occur in an intuitive way. We are also looking at ways to make movement and control match the characteristics of each system in an optimal way. In addition to allies that cooperate during battle, we are also implementing situational actions available under certain circumstances. Deeper interactions with monster will also be possible. You will be able to ride monsters and weaken specific areas of an enemy. For example, in the trailer scene where a Leviathan is causing a whirlpool, you must navigate the crumbling buildings inside the whirlpool while fighting. Boss battles will probably take place under dense and high-paced circumstances such as this. In the bottom left corner of the screen there will be an icon that displays the weapon currently in use. Until now, weapons were selected before battle and appeared automatically when fighting. This has been changed. An important element of battling will be the ‘sensation of speed.’ We are working hard to make this sensation realistically affect how lightly you move. Actually, it would be easy to make movement realistic, but we have to consider the element of play as well. We are placing more importance on the realism of movement with Final Fantasy XV than with Kingdom Hearts. The summon monsters in this game will be divided into a sort of class system, within which there will be a ranking system. The Leviathan that appeared in the trailer is of high rank and summons of this size will be rare. Summon monsters can be obtained by defeating them in battle. The theme of the story is ‘Bonds.’ The tone is serious and heavy, but there will be light comedy. The story is simple and about returning the crystals to their rightful place. We’re focusing a lot on the in-game conversations. These will be natural and not game-like or lofty. As the trailer suggests, Final Fantasy XV will ultimately culminate in one final climax, but we plan to continue the larger saga. We hope to make an extraordinary tale, and although we thought about dropping this extravagant story idea, in the end we felt it was best to make a continuing saga. We will announce how this saga will continue at a later date. We don’t want to keep you waiting for the next Final Fantasy title, so we will likely start work on a new game as we continue to finish Final Fantasy XV. We are considering ways to get Final Fantasy XV out as soon as possible. On this note we have been considering online and co-op or multiplay capabilities. This may include incorporating the use of the PS Vita, smart phones, and tablets to develop Final Fantasy in entirely new ways. The character Cor Leonis who appeared in the trailer will be a playable character. He is a member of the elite guards. His weapon is the katana. The blonde-haired male with the sharp glare, as well as the long, red-haired male characters who also appeared in the trailer are both hostile toward Noctis. The red-haired character is voiced by Keiji Fujiwara, so we made this character’s hair red. Both Reno from Final Fantasy VII and Axel from Kingdom Hearts are voiced by Keiji Fujiwara and have red hair. The water-bound country Accordo is based on the scenery and city-scape of Venice. (How many countries are there?) There will be four main countries, with other towns and villages scattered here and there. I can’t say anything about how much has been developed or when this game will be released, but I hope to say more at the Tokyo Game Show. (After discussing the game’s platforms) Nothing has been decided, but I would like to get the most use out of the next-gen systems, such as the PlayStation 4 Share button, and other features. All of the main characters introduced so far are male, but please feel assured that there will be main female characters, including Stella and a female knight. We’ve only introduced Noctis and three other characters, but as the story progresses Cor will also join your party. As you have seen in the trailer there are many characters that will appear. Stay tuned for more information. The clothing design are still done by Roen. The characters in white are people of an enemy state named Niflheim. The design concept is based on the idea of asymmetry, so the colors on either sides of their clothing are different. Cor is voiced by Hiroki Touchi who initially was slated to do the voice of a different character that appeared in a previous trailer. However, after careful consideration, we decided he was best suited for the character of Cor. Casting this time around has taken a lot of time. Choosing a voice actor for Stella took several years. We will have more to announce later. The warping ability that Noctis uses in the trailer will have in-game limits. This is a power only Noctis has, so other characters will situate themselves automatically during battle. In the trailer you saw Noctis’s short warp ability, but long warping will be possible as well. We will release more information on this later. The scene from the trailer in which Noctis is fighting the Leviathan takes place in a whirlpool. 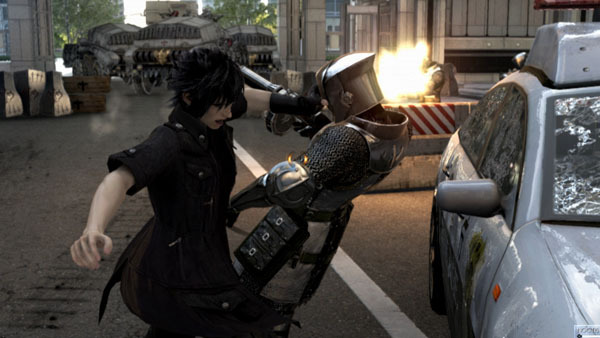 Objects and buildings are flying around and Noctis must navigate them in order to battle. The scene in which Noctis is dodging enemies in a room is a part of the same battle with the Leviathan where Noctis, the monster and an enemy nation are all battling at the same time. Due to the large explorable area, development has taken some time. Making towns smaller has been discussed but we are doing our best to maintain the large scope of the project. It would be a shame to complete this story with this game. Unfortunately, all we currently have to show is a teaser movie. The footage that we have to show you is not nearly as advanced as that of Final Fantasy XV. We will release more information about equipment and the battle system at a later date. So much is still in early development, but this is our first glance at next gen Kingdom Hearts. This will be the final installment in the Dark Seeker Saga, but we are working things so that even new-comers to the series can have fun. Like Final Fantasy XV, we hope to incorporate online play and interaction with smart phones and tablets. We are earnestly working on development, but the world selection has yet to be completed. It’s been a few years since the last numbered installment of Kingdom Hearts, but with the announcement of Kingdom Hearts III we want to put any fears fans might have to rest about this sequel. While we can’t follow this release up with anything immediately, we hope to release more information at TGS and D23 Expo Japan. The voice actors of the series will be appearing at D23 Expo Japan, so stay tuned! Fans will be able to talk with the voice actors about the series and we’ll be looking forward to sharing more about the new game. Thanks, Dengeki, Game Jouhou, [email protected].